Keep your electro scene neat with the Umbilical Cord. It has two sets of PES accessory leads housed in one neat package. Highly recommended for serious electro stim players. The Umbilical Cord utilizes two pairs of PES leads with Low Profile leads and sheaths them in neoprene tubing. 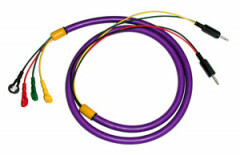 This tubing eliminates the annoyance of loose wires hanging between yourself and your power box. The Umbilical Cord is great for serious PES Power Box and toy users. The Umbilical Cord is great for serious PES Power Box and toy users. It is basically two PES leads with Low Profile connectors that are neatly organized in a single neoprene sheath. This makes for easy and neat cable management, and fewer loose wires to get tangled in while playing. Simply wash with warm water and a mild antibacterial soap, then allow to air dry.